Handmade Beaded Sequin Colorful Christmas Ornaments (3), "Poinsettia"
Crafted by hand, poinsettias host long beaded tassels. Sparkling sequins cover each blossom, and glittering golden zardozi embroidery accentuates the petals. Seema presents this exquisite set of three Christmas ornaments. 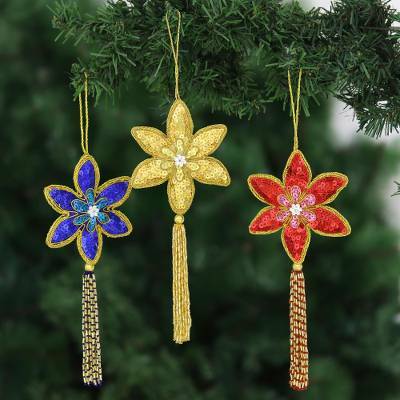 You can find beaded ornaments 'Poinsettia' (set of 3) by Seema in holiday decor & ornaments categories such as Christmas Ornaments and Floral Ornaments. Enjoy exploring these sections for other Novica treasures. Seema's love of art and Indian textiles led to the creation of her own workshop. She employs local people to create her unique line of decorative accessories that incorporate modern and traditional Indian craft techniques. Seema's workshop is expanding and she has been able to steadily increase the number of full-time assistants while hiring additional workers to meet seasonal demands. Seema is committed to giving her children every opportunity in life and works very hard to provide for them. Seema has received a $2600 microcredit loan with 0% interest. These ornaments are well made, shiny and exquisitely beautiful. They are a stunning addition to our Christmas tree! These ornaments are bright and beautiful. I'm using one for the tree and two as gifts. So nice to give a well made hand made gift. The picture doesn't do the product justice. These are very nice. I am using one for our Christmas ornament and giving 2 as gifts. I love that 2 photos or pics can fit into each frame. Lovely fabric-so glistening! Very nicely made. Thank you so much for your fine creations! Love the pillows! This was a gift to myself & probably the best I've ever received. Finding such a bright & colorful way to guard my secret ""jewels"" was a true delight. Would definitely purchase her articles again.